No Time To Explain 2 online game is a sequel to the classic No Time To Explain platform shooting game. You from the future showed up out of no where and say “no time to explain” before a giant crab monster grabbed him. 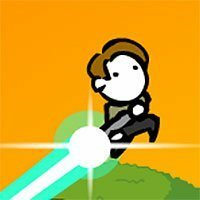 You will need to use the beam cannon to blast yourself up, and do other crazy things!